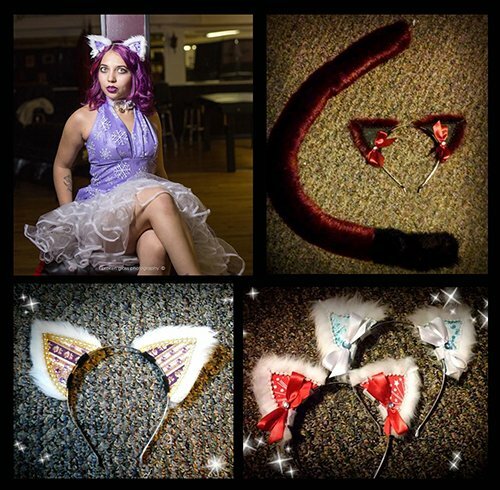 From my experience in not only modeling in the Chateau, but being a kitten, ears are a necessity when you are in kitten play, but more than that, is having a beautiful arrangement of different styles and colors to match the assemble you have planned for your evening. Whether you are going to a Work Party, a night out on the town, or even planning a photo shoot, ears are essential, and I really can’t stress the importance of having yourself a variety of ear choices. Now, that’s not to say every kitten has her own favorite types of ears, some girls like to stick to the same style. But this article is about branching out of that comfort zone, and allowing yourself to be able to get a bit more creative, because let’s be honest, wearing the same pair of ears over and over again, not only causes wear and tear on them, but it gets boring! So in this article I am covering the different styles of ears, where you can get these ears at affordable prices (if you’re not a DIY kitty) and color essentials of ears that will match almost anything. This is the most common type of ears that even not kitten play people own, you can find them super cheap around Halloween at dollar stores and discount costume bins. They’re ears that com on a head band that have just your normal kitten ear shape about them. You can find these even out of Halloween season on a lot of whole sale sites, eBay, amazon, and of course your local costume shop, I’ve see plain regular ears like this run anywhere from $2-$8, give or take if it has a tail and bow included, which some do. The Clip-in cat ears aren’t always a favorite to some kitties, while they are preferred by others. The advantage of having clip-in cat ears is that they (most of the time) are sturdy and stay in your hair without easily falling out. They also have a different shape to them, which some kittens prefer over the headband kitten ears. Another bonus of clip-in ears, is that most can actually be converted into clipping onto a headband if needed. This is something that is becoming very popular with ear makers, the accessibility to turn your ears from headbands to clip-ins. 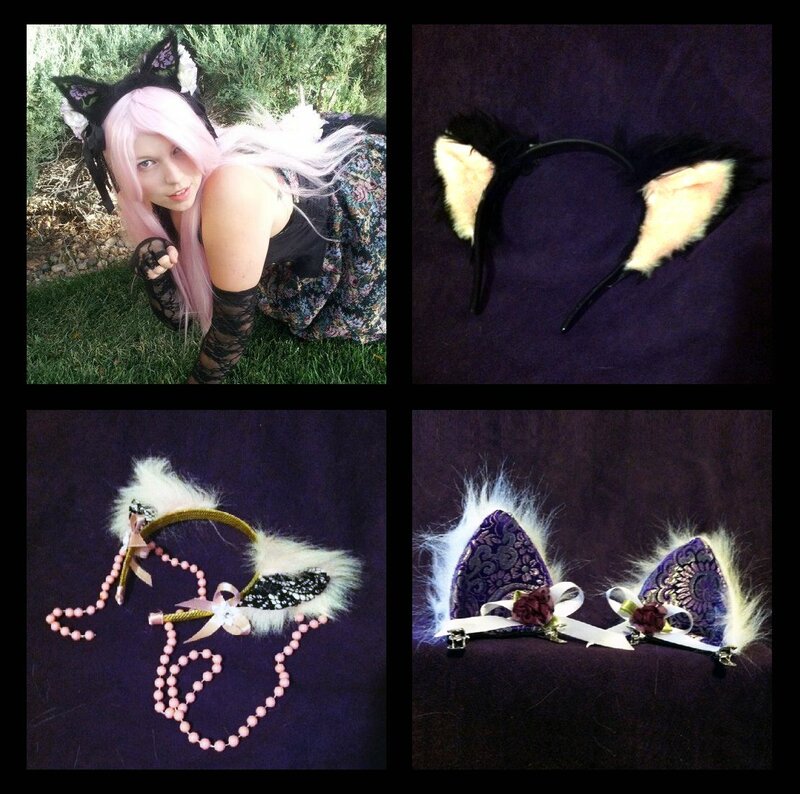 There are other kitten ear makers on Etsy who can give you the option from headband to clip-in as well, so please be sure to check out the Featured Shops list below. I don’t actually know what the style of these ears are called, but I personally am in love with them. They’re small, usually come with an elastic band and are actually shaped with a plastic material. Some have painted insides, others have a little bit of fur. Online you can find them herehttp://yayahan.bigcartel.com/product/yayas-original-cat-ears-plain but I’ve seen them in sets at Halloween and Costume shops and at conventions. I own a pair myself that are from Yayahan. They’re great ears if you don’t want to stand out as much, plus the awesome bonus of being waterproof! If you can, definitely get yourself a pair. I love them all but my favorites are high-quality realistic etsy ears like Atelier Creatura and WCS for special events and play, and high-quality bejeweled silhouette ears for everyday wear! I also have been meaning to get a pair of Yaya Han ears… they’re so cute!